Asia-Pacific solidarity statement signed by Fightback (Aotearoa / New Zealand), originally published on Green Left Weekly. 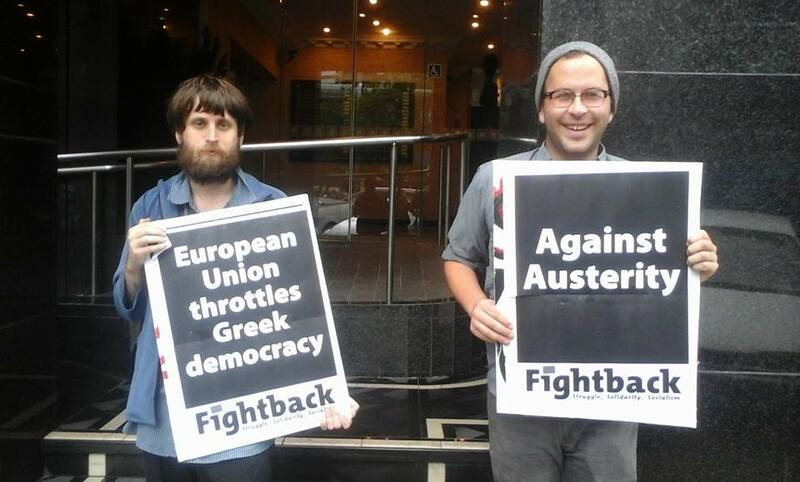 We, the undersigned, stand in solidarity with the people of Greece and the SYRIZA-led government as they prepare for a referendum on July 5, 2015, on whether to accept the continuation of the program of neoliberal austerity or chart a new course free from the debilitating stranglehold of the Troika — the International Monetary Fund, the European Central Bank, and the European Commission. We support the call of SYRIZA for a “no vote” as the only option for the people of Greece, especially the working classes, to assert sovereign control over the country’s economy and their own future. We condemn the “troika” and their allied political institutions, for forcing their policies of neoliberal austerity, privatisation, deregulation, and savage cutbacks dismantling the public sector. We, therefore, hold the Troika responsible for the massive unemployment, increased poverty, greater social inequality, and a severe economic depression now being experienced by Greece. The irony of it all is that the huge debts the Troika is demanding for repayment did not go to Greece but were used to repay private sector creditors such as French and German banks. In other words, these are onerous and illegitimate debts. We had welcomed the election of the SYRIZA-led government on a program committed to ending the neoliberal austerity policies imposed by the EU creditors and we stand in solidarity with them as they struggle to implement an anti-austerity program. The austerity program has been assessed as a colossal failure by leading economists worldwide. Despite this, the insistence of the EU creditors and their political and economic allies to resuscitate this failed program can only be construed as a cynical political manoeuvre whose real aim is to bring down the Syriza government, the first anti-neoliberal, anti-austerity government to be popularly elected in Europe. SYRIZA was a product of the mass movements’ and working people’s struggles against neoliberal austerity promoted by unbridled capitalism. Similar political organisations have arisen across Europe, such as Podemos in Spain, a product of the anti-austerity “indignados” movement. The spectre that haunts the European capitalist class is a “SYRIZA syndrome” spreading to other parts of Europe, particularly in Spain, with the election of an anti-neoliberal Podemos government. By bringing down the SYRIZA government, the capitalist hydra aims to strangle such a movement at its birth. People from all over the world, in both developing and developed countries, have been struggling for the past decades against the imposition of a whole range of neoliberal measures — liberalisation, deregulation, and privatisation, including neoliberal austerity programs imposed by capitalist governments led by the US and its allies, through the International Monetary Fund, the World Bank and other financial institutions. There has also been a long history of struggles against debt repayments and for the cancellation of odious and illegitimate debts. The world has experienced how debt burdens and neoliberal impositions have created havoc on economies, depleted natural resources, exacerbated inequalities, and impoverished peoples while siphoning off billions of dollars to global capitalist banks, giant corporations and imperialist governments. We welcome the people of Greece into the struggle of peoples of the global South against neoliberalism, onerous debts and austerity. Your struggle, is our struggle. Your victory, is our victory.